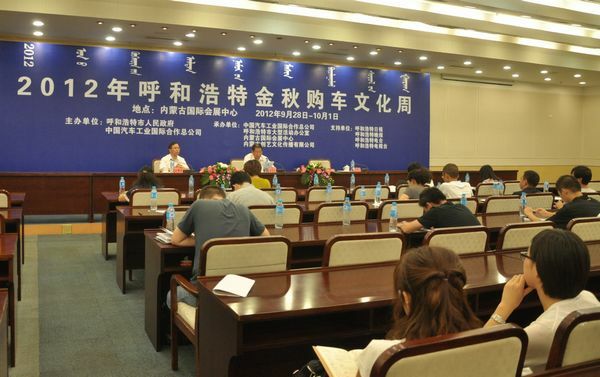 On August 27, the press conference for the Hohhot Autumn Auto Culture Week (hereinafter referred to as Auto Culture Week) was held in Hohhot. According to the vice president Jing Yongjian, the Auto Culture Week co-hosted by CNAICO and Hohhot Municipal Government will be held in the international conversion & exhibition center of Inner Mongolia from September 28 to October 1. At present, the preparations for the Auto Culture Week is going well, there will be a total exhibition area of 30，000 square meters, and nearly 40 auto companies will attend the exhibition. Vice president Jing Yongjian at the press conference pointed out that the Auto Culture Week is the second auto show co-hosted by the CNAICO and Hohhot Municipal Government in the Hohhot city. According to market requirements, the exhibition mode is made innovative, which are reflected in three respects. Firstly, the exhibition adopts the small & exquisite operation mode. Local dealers are invited to directly participate in the exhibition, and buyers and sellers can make transactions face to face, which eliminates the regional price difference and effectively promotes the development of Hohhot local auto market. Secondly, the Auto Culture Week is not only an important auto transaction platform, but also reflects the show quality and enriches the exhibition culture. A series of business activities and traditional culture shows, such as essay contest, calligraphy and painting competition, car model contest, and try-out driving, held at the same time attracts and pleases visitors. Thirdly, the Auto Culture Week will be held during the Mid-Autumn festival and the National Day, which meets exhibitors’ sales promotion requirements and ordinary people’s rich cultural requirements. Vice president Jing Yongjian said that CNAICO, as the largest-scale and strongest central enterprise in the China auto exhibition industry, has a wide range of client resources and professional exhibition teams. Under the strong support of Hohhot Municipal Government, a characteristic and high-level Auto Culture week will be held. Since 2009, CNAICO has launched the Hohhot international auto exhibition and the Ordos international auto exhibition in Inner Mongolia, greatly improving the region's auto exhibition level and economy. With rich industry experience and a unique market perspective, CNAICO has recognized that Hohhot, Ordos, and Baotou (as the "golden triangle") are the most important areas for exhibition in Inner Mongolia. Baotou's first international auto exhibition will be open this fall. At that time, the three major international auto exhibitions and the Auto Culture Week will push the auto exhibition in Inner Mongolia to a whole new level.